Annie Proulx sat down to talk with James Xiao, Sycamore Review’s fiction editor at the time, before a live audience at Purdue University in April. You can click on the following links to listen to audio clips from the conversation. Clip 3: Ah, Here’s a Pretty Good Sentence! 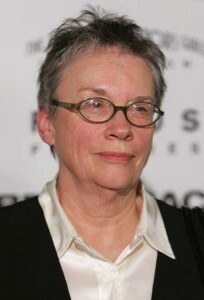 ANNIE PROULX is the author of eight books of fiction, including The Shipping News, for which she won the Pulitzer Prize and the National Book Award; Postcards, for which she became the first woman to win the PEN/Faulkner Award in Fiction; Close Range: Wyoming Stories, which included the novella, “Brokeback Mountain”; and, most recently,Fine Just the Way it Is, the third installment in her Wyoming Stories series. Her work has been adapted for film, including 2001’s The Shipping News and 2005’s Brokeback Mountain, which won three Academy Awards. The full transcript of our interview with Annie Proulx was featured in Issue 23.1 Winter/Spring 2011. To purchase a copy, check out our subscriptions page.